An ultra-high data rate time reversal (TR) multiple-input multiple-output (MIMO) ultra-wideband (UWB) communication system with space-time precoding is proposed. When the symbol duration is set to approach the duration of UWB monocycles, the data rate is close to the limit, resulting in the severe intersymbol interference (ISI). The zero-forcing (ZF) criterion-based space-time precoding presented in this paper eliminates both ISI and multistream interference (MSI) caused by spatial multiplexing at the sampling time. With less demand for the degree of freedom (the number of antennas) than other existing schemes, the proposed scheme enables the data rate to reach the order of Gbps without losing bit error rate (BER) performance. Since TR signal preprocessing and the proposed precoding both require the channel state information (CSI), a simple but effective channel estimation algorithm is also proposed to evaluate the impact of channel estimation on the proposed scheme. Ultra-wideband (UWB) impulse radio communications, as a promising candidate for location-aware indoor communications, wireless sensor networks (WSN) and wireless personal area network (WPAN), has received significant attention in both academia and industry in recent years [1, 2]. The most attractive feature of UWB is its potential to offer great capacity in theory as compared with the narrowband systems. However, the conventional UWB system shows much lower data rate than expectation. This is because capturing the energy of dense multipath channel  and combating severe intersymbol interference (ISI) caused by large maximum excess delay of the channel  will increase receiver complexity which limits both detection performance and data rate under the condition that receivers with high complexity are not preferred in UWB short-range applications. To reduce receiver complexity, noncoherent scheme is developed to bypass the complicated treatments on UWB channel, whereas the deterioration of detection performance and the reduction of data rate are inevitable . On the other hand, the system complexity can be shifted from the receiver to the transmitter, where the power and computation resources are generally enough to implement signal processing. Since preprocessing the signal before transmission may cope with the deteriorating effects of the channel, the receiver can keep a simple structure without losing detection performance and data rate. In particular, signal preprocessing scheme is desirable in the networks where a central node with sufficient power and computation resources serves many distributed nodes with extremely stringent limits on complexity and power consumption . A time reversal (TR) (TR is also referred to as pre-Rake diversity combining ) preprocessing-based system with minimum mean-squared error (MMSE) equalizer is firstly applied to combat ISI in UWB communications . TR preprocessing is that the transmitter takes the time reversed channel impulse response (CIR) as a filter to prefilter the original signal before transmission. If the prefiltered signal is radiated into the channel, it convolves with the CIR and leads to a strong peak at the output of the channel at one particular instant. As a result, the receiver can be simplified significantly and meanwhile makes full use of the energy from all paths of the channel. Recently, the TR-based UWB system and its variations have been investigated in [9–14]. Multiple-input multiple-output (MIMO) technique, employing multiple antennas at the transmitter and receiver, is capable of increasing data transmission rate by spatial multiplexing without expanding the bandwidth. In order to transmit parallel data streams simultaneously (spatial multiplexing), the multistream interference (MSI) of MIMO channel must be mitigated. The potential of TR-based UWB system with multiple antennas to increase data rate is studied in . In , a TR-based scheme for MSI suppression is proposed for MIMO-UWB system without considering ISI. (To be exact, the schemes in  are proposed for multiuser UWB system, which consists of an access point with multiple transmit antennas and several single-antenna radio terminals. Obviously, it is equivalent to a MIMO-UWB system without cooperation among receive antennas.) Further, TR is proposed to cope with both MSI and ISI in MIMO-UWB system in . It is worthwhile to note that the interferences are not absolutely eliminated by TR in [10, 11] though they are mitigated to a certain extent, which becomes the principal factor to cause error for the large signal-to-noise ratio (SNR) and results in the deterioration of bit error rate (BER) performance ultimately. In this paper, we propose an ultra-high data rate TR-MIMO-UWB system with space-time precoding. Multiple antennas can increase data rate, whereas the occurrence of MSI degrades the system performance. The ultra-high data rate UWB transmission usually requires extremely short symbol, thus ISI is very strong. In order to implement a TR-based UWB system, the channel state information (CSI) must have been available at transmitter. Therefore, the interferences (MSI and ISI) of TR-MIMO-UWB system should be canceled by using CSI at transmitter rather than at receiver. In [15, 16], the precoding scheme, which is extensively applied in narrowband system, has been employed to eliminate the MSI of TR-MIMO-UWB system. Since the effect of ISI is not taken into account, their system performances are degenerating rapidly as symbol duration is shorted. In this work, the space-time precoding matrix based on zero-forcing (ZF) criterion is originally derived, which is independent on the degree of freedom (the number of antenna). The proposed space-time precoding can effectively eliminate both ISI and MSI, and it is beneficial to achieve the high data rate of TR-MIMO-UWB system up to the order of Gbps without losing BER performance. Since TR signal preprocessing requires the CSI, a simple but effective channel estimation algorithm for TR-MIMO-UWB system is also presented in this work. In [13, 14], the authors utilize a feedback channel to send the estimated channel information from the receiver to the transmitter. Because the UWB channel is characterized by dense multipath, that is, the number of multipath is large, the required bandwidth for the feedback channel is huge. Hence, the implementation of feedback channel is unfeasible. The proposed channel estimation exploits the reciprocity of the UWB channel which has experimentally been demonstrated in . That is to say that the receiver sends training symbols, and the channel estimation algorithm is performed at transmitter. As the channel estimation algorithm is introduced to acquire CSI, the imperfection of CSI inevitably presents at this more practical UWB system. Since the proposed scheme can more effectively use the CSI to cancel the interferences, it shows more robustness to the error of channel estimation. The rest of this paper is organized as follows. The system model of ultra-high data rate TR single-input single-output (SISO) UWB is described in Section 2, and the TR-MIMO-UWB system with space-time precoding is proposed in Section 3. In Section 4, we address the channel estimation problem for TR-MIMO-UWB system. Section 5 presents the simulation results. Finally, conclusions are drawn in Section 6. The boldface letters denote vector or matrix. is a matrix of size with all entries being zeros. represents convolution operation. stands for integer floor operation. returns transformed into a column vector with one column stacked onto the next. , and stand for the Euclidian norm, the transpose and the inverse of matrix , respectively. is the transmitted waveform for one binary symbol. where is the Dirac delta function, is the number of resolvable multipath components (MPCs), is the fading coefficient of the th MPC, and is the minimum multipath resolution, which is equal to the duration of ( ), as any two paths whose relative delay is less than are not resolvable. The maximum excess delay of the channel is denoted by . In conventional UWB systems, the symbol duration is usually set large enough ( ) to avoid or alleviate ISI. However, in this paper, is set much smaller than ( ) to achieve an ultra-high data rate. It can be found that the waveform duration of is , and thus the transmitted waveform for one symbol overlaps that of other symbols. It can be observed in (11) that the concerned interferences are only dependent on the sampling value of the ECIR, yet they do not relate to the value of ECIR at any other time. The process that signal transmits from the transmitter to receiver in the absence of noise. (a) Signal at the output of transmitter. (b) The process of transmitted signal convolving with CIR. (c) The received waveform for one symbol. (d) The discrete form of ECIR. (e) Received waveforms are interfered by each other. A TR-MIMO-UWB communication system includes a transmitter equipped with antennas and a receiver equipped with antennas. parallel data streams are transmitted simultaneously. In typical indoor environments, the UWB channel is quasistatic [17, 18]. That means UWB channels remain invariant over a block of symbols duration, but they are allowed to change from block to block. Therefore, block transmission is adopted in the proposed scheme. We consider a block of bit binary symbols, which is represented by column vectors for . The column vectors are stacked in one column vector which is . where is the energy normalization factor which guarantees the average transmitted energy to be for one binary symbol. where is the estimation of which stands for the impulse response of the multipath channel between the th antenna at transmitter and the th antenna at receiver. In Section 4, a channel estimation algorithm is proposed to obtain . It is worthwhile to note that all parallel data streams are simultaneously transmitted from the th antenna at transmitter. is the discrete noise component. In order to transmit parallel data streams simultaneously at a very high data rate without losing performance, the MSI and ISI must be eliminated. As the CSI is already available for the implementation of TR signal preprocessing, we can use the CSI to calculate the precoding matrix . In this paper, we seek the solution based on ZF criterion. where , , is the th sampling value of ECIR matrix. From (20), it can be found that the space-time MIMO relationship between the transmitted information bits and the sampling values of received signal is constructed. Therefore, the interference in time domain (ISI) and the interference in spatial domain (MSI) can be eliminated at the same time by employing ZF precoding matrix to diagonalize . Since is a square matrix, its right pseudoinverse exists, and (24) can be calculated. is the estimated ECIR between the th equivalent transmit antenna and th receive antenna. Replacing with in (22), the estimated STCM is immediately obtained and used to calculate the precoding matrix . Obviously, if the estimations are perfect, the interference can be effectively eliminated; otherwise, the imperfect estimations may result in the residual interferences. Some remarks about the TR-MIMO-UWB system with ZF space-time precoding are essential. From (13), all parallel data streams are simultaneously transmitted from one antenna. That means the number of transmitted parallel data streams is independent on , but only lies on . This is not in common with ordinary MIMO systems in which parallel data streams can be normally transmitted. This is because the TR MIMO system in this paper is a wideband system, where the TR processing filters or the CIR act as orthogonal codes to spread information bits (they are actually quasiorthogonal and after TR preprocessing the interferences are mitigated to a certain extent). Therefore, the data stream number is not constrained by . There is no cooperation among receive antennas in the proposed scheme so that the scheme can be naturally extended to multiuser UWB system. The motivation to insert the zero guard vectors is to prevent the interference between blocks. Admittedly, this operation will result in some data rate reduction. In fact, the data rate of the proposed system is bits per second (bps). Owing to that, the coherence time of the typical indoor UWB channel is rather larger than the maximum excess delay of the channel, is of the same order as . Therefore, the data rate is mainly dependent upon symbol duration . A ZF prefiltering scheme for MSI suppression is proposed in , which forces received interference to zero within the whole symbol duration. 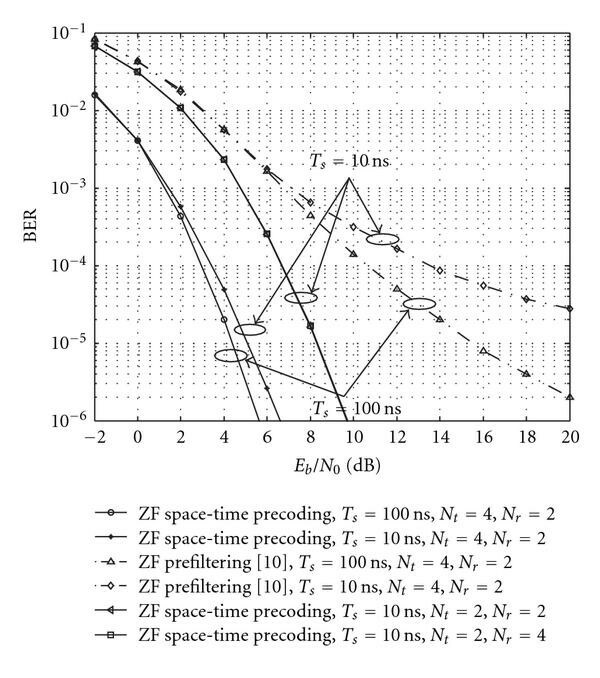 Since our ZF space-time precoding only forces the received interference to zero at the sampling time within one symbol duration, the proposed precoding scheme needs less degree of freedom than ZF prefiltering. For example, when , our scheme can work well, but ZF prefiltering is inapplicable, and it needs more transmit antennas. As indicated in last section, the operation of the canceling interferences requires knowledge of the channels. This information must be provided by channel estimation. In this section, we address the channel estimation problem for TR-MIMO-UWB system. for . In (28), the repetition interval of the training pulses is larger than to avoid interference between training pulses. where the estimation noise with zero mean and variance . The training symbols can be repeated to send times to get estimations of each fading coefficient. Then, estimation results are averaged to reduce the estimation noise. The result of the averaged estimated fading coefficient is , where is the averaged estimation noise with variance . The corresponding estimated CIR is . Since the UWB short-range applications always occur in the indoor entironment, where the surrounding objects and UWB transceiver are nearly quiescent [17, 18], the coherent time of channel is very long. Therefore, we can increase to reduce the estimation noise within the channel coherent time; however, this will result in a data throughput reduction. When goes to infinity, the estimation noise goes to zero and the estimated channel tends to perfection. The impact of channel estimation on TR-MIMO-UWB system with ZF precoding is investigated by simulations in Section 5. In this section, simulations and comparisons are performed to validate the proposed scheme. In all cases, the MIMO-UWB channel is generated according to IEEE 802.15.3a channel model recommendation CM4  and truncated to ns. Although the channel model CM4 is designed for single-input single-output (SISO) scenario, the extension to a MIMO configuration is achieved by assuming that the MIMO channel parameters are independent and identically distributed realizations from the same statistical model. The used impulse shape is the second derivative of a Gaussian function , where is the energy normalized parameter and ns is the pulse shaping parameter. The duration of is set as ns so that the minimum multipath resolution of channel is ns. First, we evaluate the BER performance of TR-MIMO-UWB system with ZF precoding proposed in this paper and compare it with the spatial multiplexed TR-MIMO-UWB system proposed in . In this case, both the transmitter and receiver are equipped with antennas and parallel data streams are transmitted from transmitter simultaneously. The symbol duration is set as 0.5 ns and 10 ns, respectively, which are much smaller than ns. is set as 200. In this test case, we assume the CSI is perfect. The BER versus curves are plotted in Figure 2. It is observed that the BER performance is improved by the proposed space-time precoding scheme. When ISI is strong ( ns), the BER curve of the spatial multiplexed TR-MIMO-UWB system  suffers a floor at high , while the proposed scheme can obtain a remarkable gain. When ns, and . We can compute the bit rate Gbps. BER performance comparison between the proposed TR-MIMO-UWB system with space-time precoding and the TR-MIMO-UWB system. , . Then, the comparison between the proposed scheme and ZF prefiltering scheme  is given. In order to meet the needs of degree of freedom for ZF prefiltering, we set the parameters , , and the length of prefiltering 400 chips. The CSI is perfect for both schemes. From Figure 3, the proposed scheme outperforms ZF prefiltering in terms of BER when both schemes choose the same deployment of antenna ( ). The proposed precoding scheme focuses energy on the sampling time to eliminate interferences and ignores other time; therefore, it has higher energy efficiency than ZF prefiltering. Since ZF prefiltering does not consider ISI, the BER curve suffers a floor at high when ISI is severe. In order to show that the proposed scheme demands less degree of freedom than ZF prefiltering, the BER performances of the proposed scheme when , and , are also evaluated. It can be shown the proposed scheme outperforms ZF prefiltering even though less transmit antennas are used. When more transmit antennas are employed, the proposed scheme obtains a considerable gain due to a higher energy efficiency provided by more degree of freedom. It is worthwhile to point out that when and , the proposed scheme can transmit parallel data streams normally, this is not in common with ordinary MIMO systems. It is shown in Figure 3 that the performance of the proposed scheme with , and that with , are uniform. This is because the same number of transmit antennas offers the same degree of freedom to eliminate interference and results in the same performance. However, the data rate with is twice as high as that with . 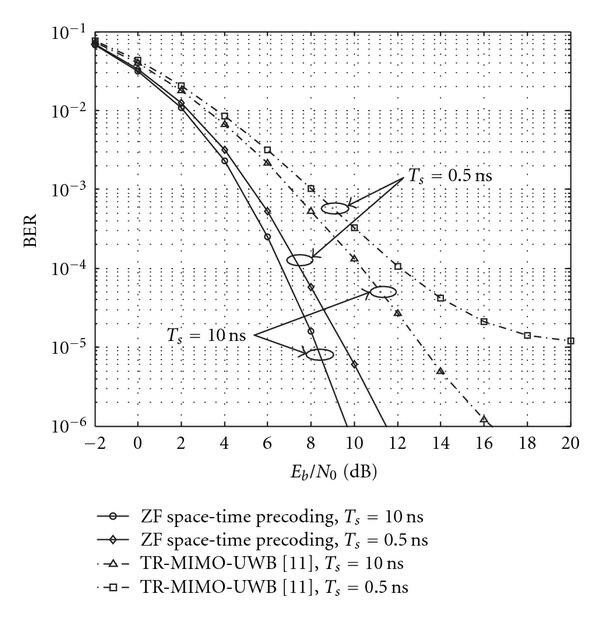 BER performance comparison between the proposed ZF-based space-time precoding for TR-MIMO-UWB system and ZF-based prefiltering scheme. We have so far assumed the CSI is perfect. 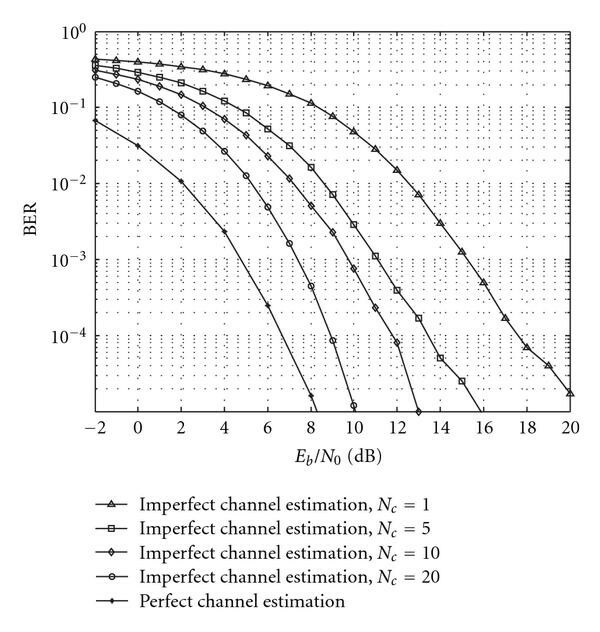 In this case, the impact of imperfect channel estimation on the proposed scheme is investigated. Both the transmitter and receiver are equipped with antennas, and parallel data streams are transmitted from transmitter simultaneously. The data symbol duration is set as 10 ns. The channel estimation algorithm proposed in Section 4 is employed in the initialization stage of one block. Orthogonal training symbol set is used. The repetition interval of the training pulse is set as ns to avoid interference between training pulses. The repetition time of training symbols is set as , and 20, respectively. Increasing will improve the accuracy of channel estimation. The simulation results are shown in Figure 4. The BER performance which corresponds to the perfect channel estimation is also plotted. As increases, the BER performance gets better at the price of data throughput reduction. Therefore, there is a tradeoff between performance and data throughput. The imperfect estimation brings out the residual interferences, and the BER curve suffers a floor at high . That is because the residual interferences become the principal factor to cause error at high . When , the estimation noise is small, and the corresponding BER is close to that of perfect channel estimation. The impact of channel estimation on the proposed scheme. , , and ns. Finally, the dependence of three schemes (the proposed scheme, the spatial multiplexed TR-MIMO-UWB system  and ZF prefiltering scheme ) on channel estimation is investigated. The system parameters are set as follows: , , and ns. The orthogonal training symbol set used to execute channel estimation algorithm is the same as TEST 3 and ns. The repetition time of training symbols is set as , respectively. Figure 5 presents the simulation results. When the transmitter can only use imperfect CSI to implement preprocessing (this comes nearer to practical situation), the improvement of BER performance obtained by the proposed scheme is remarkable. From Figure 5, when imperfect CSI presents, the performance of the proposed scheme is also solid and outperforms other schemes. Notably, the performance of the proposed scheme with still outperforms the two other schemes with . That is because the CSI is more effectively used to cancel the interferences by the proposed scheme, and the residual interferences are least. The spatial multiplexed TR-MIMO-UWB system  can suppress the ISI and MSI to a certain extend, and it shows some robustness to imperfect CSI. Since ZF prefiltering scheme leaves ISI out of consideration , its performance becomes worst at high , where the ISI and the residual MSI are strong. BER performance comparison between the proposed scheme and other schemes when imperfect CSI presents. , , and ns. An ultra-high data rate TR-MIMO-UWB system with space-time precoding is proposed in this paper. 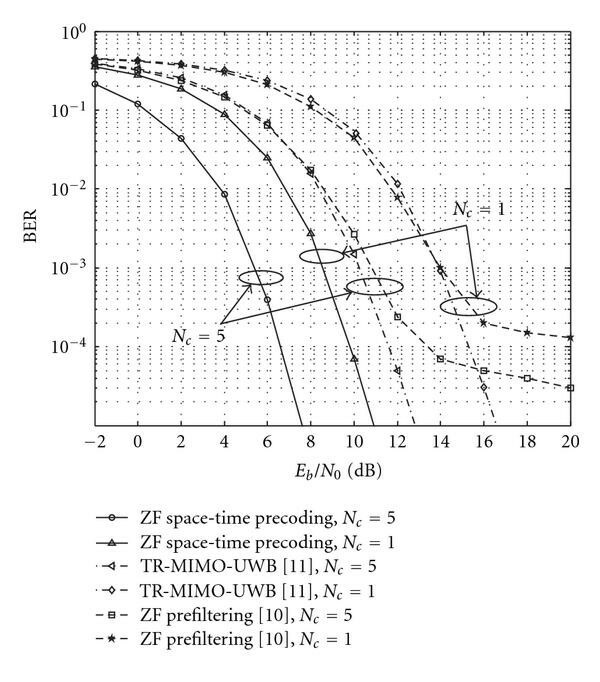 After the system model of TR-MIMO-UWB is investigated, the computation of the ZF criterion-based space-time precoding matrix is originally derived. With less demand for degree of freedom than other schemes, the proposed space-time precoding scheme can effectively eliminate both ISI and MSI. As a result, the TR-MIMO-UWB system achieves ultra-high data rate of the order of Gbps and keeps BER performance well. The performance of the proposed scheme is evaluated through computer simulations. It is shown that the proposed scheme outperforms the spatial multiplexed TR-MIMO-UWB system and ZF prefiltering scheme. A simple but effective channel estimation algorithm is proposed to provide the estimated CSI for preprocessing. The impact of channel estimation on the proposed scheme is also investigated by simulations. The results confirm that the CSI is more effectively used to remove the interferences by the proposed scheme. This work is financially supported by the National Natural Science Foundation of China (NSFC) (Grant no. 60972075).